`This is a book for anyone who has ever laboured under a deadline, battled a stubborn pig of a boss, or half drowned beneath a wave of bureaucracy and paperwork. Put off what you intended to do today and go out and buy it, right now. 'Rachel Cooke, ObserverAn Observer Book of the YearShortlisted for the TA First Translation Prize 2017When Jeanne is accepted on to a PhD course, she is over the moon, brimming with excitement and grand plans - but is the world ready for her masterful analysis of labyrinth motifs in Kafka's The Trial?At first Jeanne throws herself into research with great enthusiasm, but as time goes by, it becomes clear that things aren't quite going according to plan. 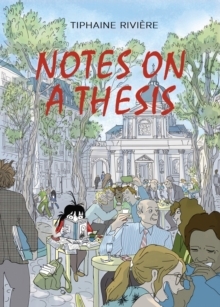 Notes on a Thesis is a reminder of the strangeness of academia, of every awful essay, every disastrous exam, and every insanity-inducing dissertation. If you've ever stared gloomily at a blank page, battled with office administrators or driven yourself (and everyone you know) mad by droning on about your work, then Notes on a Thesis will make you laugh (or cry) in recognition.